The pace of innovation around the mobile landscape is stimulating. Mobile is emerging as the preferred channel of choice for large groups of consumers globally. As mobile is evolving into one of the most influential technologies for consumers, marketers are taking necessary steps to understand customer behavior within specific product categories. Developing an understanding of the mobile behaviors of your target audience is key to building and refining a strong mobile strategy. 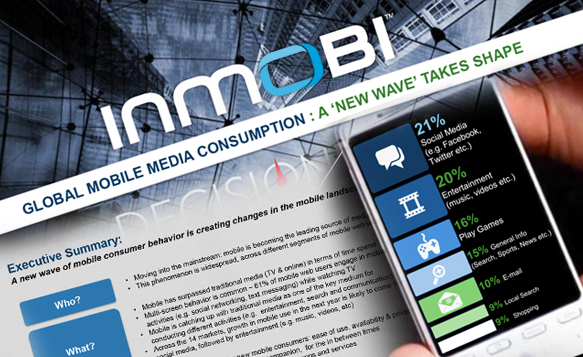 InMobi’s third Global Mobile Media Consumption Survey provides unique insights into the mobile consumer behavior of 14,000+ respondents across 14 markets. This report provides a view of some of the key trends that the survey results have revealed, both by looking at the individual country picture and at the consolidated global level. The findings demonstrate how mobile advertising can play a key role in assisting advertisers that is increasingly challenging in a fragmented media environment.